Wegmans is the Disneyland of grocery stores: The employees are all extremely friendly, there's wonder hidden in every aisle, and rumor has it the cryogenically frozen head of Walt Wegman is hidden in the basement. Ok, maybe not that last part. But the beloved regional grocery store chain -- with 98 stores in New York, Pennsylvania, Virginia, Maryland, New Jersey, and Massachusetts -- has earned a legion of rabid fans based on the strength of its on-point product line. I would know: I worked there for 9 years and still find myself there regularly picking up the artichoke and asiago dip with sliced baguette for a Sunday football party and grabbing some of the Wegmans frozen pizzas to inhale after a night out. But where do you start on the wonder that is Wegmans? These are the items former employees like me and customers alike flock to the supermarket for on the regular. Grab these, and you'll no doubt be indoctrinated into the cult of Wegmans. It’s completely understandable if you get slightly emotional when you see their cheese section. It’s just so beautiful! Wegmans has their own brand of pretty much every cheese you can imagine, with some clear standouts like a rich and decadent Crémeux de Bourgogne, which takes on an almost fondue-like consistency at room temp. They have other soft brie cheeses and blues, plus a variety of Cheddars, including a Beecher’s 26-month aged number made just for Wegmans. Grab a few options to create your own cheese platter with add-ons like the balsamic-cherry or caramel-pecan toppings. Living in Buffalo, where we have some of the world's best pizza with cup-and-char pepperoni (shameless hometown plug! 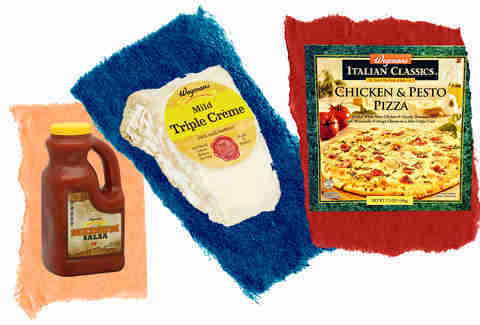 ), I was shocked to discover that even Wegmans' average cheese, pep, and supreme frozen pizzas are strangely delicious. The frozen pizza selection is kind of an overachiever, and includes a selection of wood-fired pizzas that taste dangerously close to restaurant quality at a fraction of the price. The options are seemingly endless, and include Lombardia with a gorgonzola-forward cheese blend and the Sicilia with ricotta cream, mozzarella, zucchini, grilled eggplant, peppers, spicy chili oil, and red onion. Average store-bought salsa is alright, but Wegmans knows that tortilla chips deserve more and delivers with a variety of roasted housemade options. Try the roasted salsa verde with tomatillos, jalapeno, lime juice, garlic, and cilantro for a totally different flavor, one that might tempt you to dump some vodka inside and make a little verde Mary. The roasted chipotle salsa, another popular option, tastes great on tacos or enchiladas. If you prefer something simpler, they do have better-than-typical sweet pepper, mild, medium, and hot salsas with a fresh flavor of roasted tomatoes. Wegmans bakery has a wide variety of seasonal breads to go along with sandwich-primed loaves. The garlic Tuscan bread or the jalapeno cheese bread kick your grilled cheese (or BLT) up about 10 notches. The rosemary olive oil loaf is perfect for dipping in soups, and the olive bread is salty and flavorful enough to stand on its own. Then there's the red, white, and blue bread with a coarse sugar crust and the cranberry orange bread, which pairs beautifully with a soft creamy brie. If it's baked at Wegmans, chances are it's going to be as good as your favorite bakery. 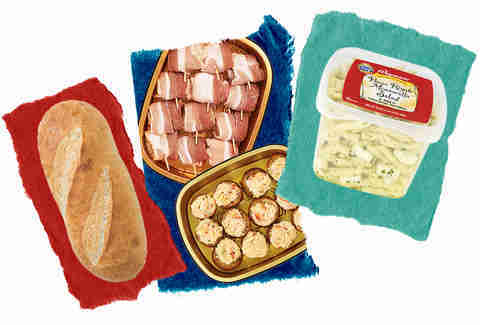 When you're hungry and need something quick, but haven't quite reached that hangry state of desperation that requires you to shovel any and everything available in your face, Wegmans has a variety of ready-to-cook seafood and meat options that you just pop into the oven, container and all. There are meals like chicken caprese with slices of fresh mozzarella; pepper-stuffed flank steak with olives and spinach; pork chops stuffed with sweet apple pecan stuffing; and even giant soft pretzels smothered in lobster or crab meat stuffing. Looking for something fancy from the sea? There are juicy lobster-stuffed mushrooms, crispy bacon-wrapped scallops, crab-stuffed hot peppers, and so much more. You'll feel like you're in a restaurant. 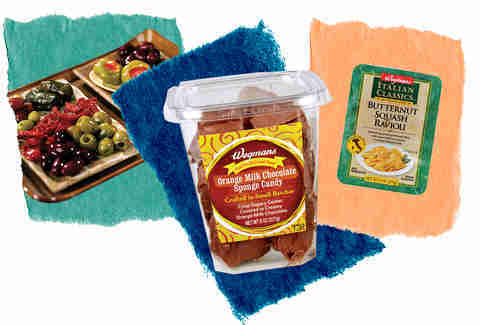 Wegmans surpasses the average store-bought mac salad with artisan options like the penne, tomato, and mozzarella salad with chunks of mozzarella cheese seasoned with vinegar, spices, and oil; Greek shell pasta salad with feta, olives, cucumbers; and pasta-based hits. They even have versatile ones that can be eaten hot or cold, among them the capellini asiago salad made with thick cut pieces of asiago cheese, thin capellini, and bruschetta. Basically, this is how you win the sides competition at a cookout without actually trying. If you're just buying olives jarred, you're doing it wrong. Wegmans' olive bar is like a museum of olive possibilities. There are dense, pitted, oil-cured olives with mild flavor. Intense marinated numbers. Olives mixed with roasted marinated tomatoes and peppadews. The selection of stuffed olives with feta, anchovies, blue cheese, garlic, almonds, and jalapenos seems to stretch on forever, accompanied by spreads, dips, mozzarella balls, ham-and-cheese-stuffed crunch peppers, and stuffed grape leaves. All that's missing is a bottomless martini glass. A grocery store might not be the first place you think of to pick up fancy chocolates, but don't underestimate Wegmans (on this or anything). The chocolate-covered, peanut butter-filled pretzel nuggets are, hands down, one of the most amazing sweets you can get at a grocery store. There's coarse sea salt caramels in milk or dark chocolate, little round carmelettes, dark chocolate cherries, and chocolate covered popcorn, to name a few standouts. The aisle will make you feel like Charlie Bucket, but with lowered odds of being murdered by a deranged recluse. The Wegmans Italian Classic line tastes just like homemade pasta, without the hassle of dirtying up your counter or exerting effort. Among the most popular is the eggplant parmesan ravioli made with egg pasta and filled with roasted eggplant, tomato, oil, mozzarella cheese, and garlic. The portobello mushroom-striped jumbo raviolis taste excellent tossed in the garlic olive oil, and the Buffalo milk ricotta and truffle cappellacci has an earthy mushroom flavor with creaminess from the cheese that takes it to another level. If you're looking for something a little more plain, they offer original pastas in a variety of shapes and sizes like pappardelle, orecchiette, girelle, and more, perfect for a simple toss in marinara. Because chips and salsa are so last year, the dessert chips and dip is where it's at now, and the cannoli chips and dip are a revelation. Basically, this is what would happen if some angry baker smashed a giant cannoli shell into chips, then served the filling as a dip. Hey, cannolis in their original shape fall apart anyway, so they just bypassed the whole crumbs going down your shirt during the first bite thing. The mini chocolate chip cookies are legendary for being so addicting that you accidentally eat the whole container. There's something in them that just make them insanely soft and chewy. The other flavors -- white chocolate chip, molasses, sugar, shortbread, chewy coconut macaroon -- aren't quite as popular as the original chocolate chip, but still worth a try. Maybe as a side dish for a meal of mini chocolate chip cookies. 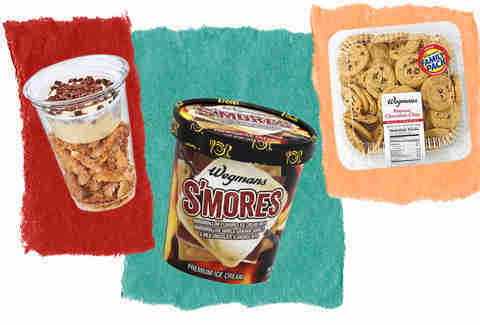 Along with the usual flavors like vanilla, chocolate, and cookie dough, Wegmans ice-cream offerings include their own Ben & Jerry's-worthy concoctions. That includes an insanely popular s'mores ice cream, whose base of marshmallow is mixed with graham cracker, marshmallow, and hearty chunks of milk chocolate. It’s safe to say that the s'mores one is probably their most popular, but they have others to choose from like Scrapin' the Bowl, made from chocolate and vanilla ice cream with pieces of brownie and cookie dough. Banana ice cream is hard to find, but they have a flavor called Banan-a-Peel'n, which is a base of banana ice cream with marshmallow, peanut butter cups, and fudge. It's enough to make you forget about Vermont for a minute. After being stuck with making rotisserie chickens for years, it took me awhile to actually buy them and realize how delicious they truly are, but there's just no denying the juicy meat and golden crispy skin that emerges from the Wegmans rotisserie. 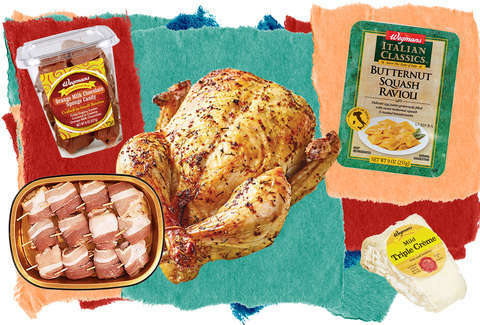 The meat practically falls off the bone, and the chickens come in multiple flavors like plain (perfect for soup stock), barbecue-rubbed, or seasoned with tart lemon pepper. Plus, they’re ridiculously cheap. For $4.99 you get a whole, cooked chicken that you can easily use for multiple meals and recipes for days. The growing trend of sneaking vegetables into your everyday dishes is becoming more and more popular with veggie noodles and vegetable-based pizza crusts slowly taking over all major grocery stores. Wegmans takes it a step further by creating creamy vegetable purees to pour over pastas, grains, and proteins. As of right now, they have a sweet carrot-based puree sauce, a zucchini-loaded version,, and a cauliflower sauce that resembles an alfredo sauce in look and texture. Consider it the little white lie you never knew you needed to be told. 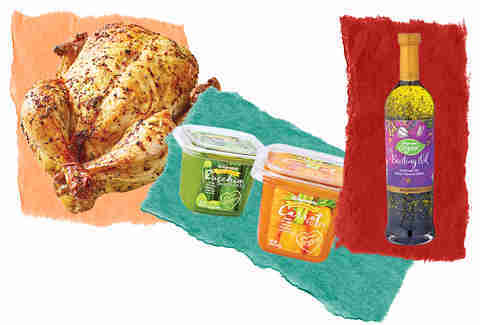 Wegmans' basting oil needs to be a staple in kitchens nationwide. Dramatic? Probably. True? Absolutely! It adds the flavor of an herb garden to any fish, meat, or vegetable. The base is in organic sunflower oil mixed with parsley, garlic, and thyme. A quick drizzle on pretty much anything savory will make you a true believer. Jessica Kelly is a freelance food and travel writer that gave Wegmans 9 years of her youth. She now has way more fun being a loyal customer. Watch her buy way too much from the olive bar and cheese department on Instagram @Adventures.Are.Waiting.